The Latest from Sorbothane, Inc. 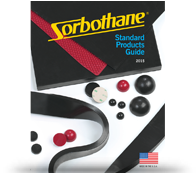 Check back often for the latest company news from Sorbothane, Inc., recent announcements and details of upcoming tradeshows and events. In February, Sorbothane, Inc. returned to the Pacific Design Show. As always, members of the Sorbothane Team were available on-site to field questions and exchange ideas with visitors. Learn more. At the 2019 Pacific Design and Manufacturing Show, Sorbothane, Inc. will spotlight shock and vibration solutions featuring the proprietary viscoelastic material Sorbothane. Learn more. The Sorbothane® 3/4 Ultra PLUS Stability Insole was recently introduced to retail buyers and attendees at the Outdoor Retailer Summer Market. Learn how the insoles provide much needed pain relief and comfort. Sorbothane, Inc. recently announced that they will be attending the Outdoor Retailer Summer Market in Denver, Colorado this July, where they will have a booth with product giveaways and Sorbothane® Insole samples! Learn more. The Sorbothane, Inc. booth was well attended at the 2018 Pacific Design & Manufacturing Show. Sorbothane product managers and engineers were available during the show, formulating custom solutions on-site. Learn more. This February, Sorbothane will feature the proprietary viscoelastic material of Sorbothane® at the 2018 Pacific Design and Manufacturing Show. Learn more. Sorbothane, Inc. recently introduced the next-generation Sorbothane® Insole called The Ultra PLUS. Our new Stability Insoles cushion and cradle the foot in comfort while helping to protect against impact-related pain and discomfort. Learn more. Sorbothane recently announced that they will be attending The Running Event in November, 2017, where they will be introducing the new Ultra PLUS Performance Insoles. Learn more. In 1975, material scientist Dr. Maurice Hiles embarked on a series of experiments to measure the effect that running and walking have on the human body. After years of research and testing, Sorbothane® was born. Learn more about the evolution of Sorbothane®. Sorbothane previewed the new Ultra PLUS insole at the Outdoor Retailer – Summer Market 2017. This insole features Sorbothane® for a combination of stability and protection.